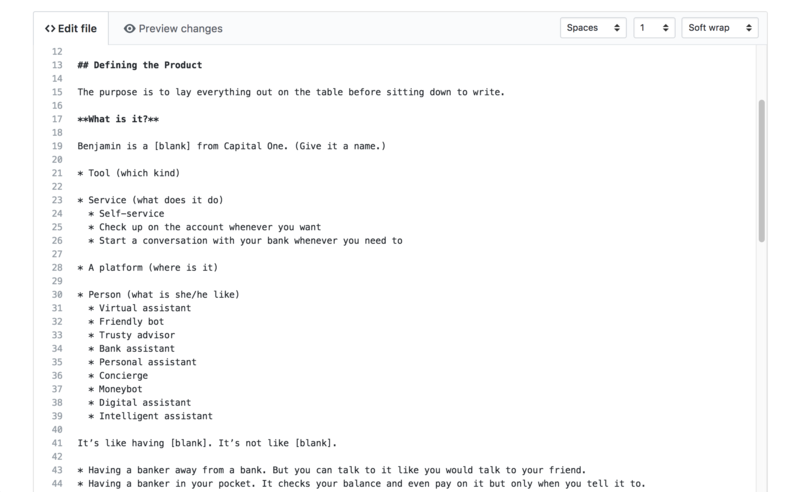 During my internship at Capital One, I helped concept and write the content for introducing Capital One’s chatbot to associates. The content was used for the landing page that encouraged employees to sign up for the internal beta testing. 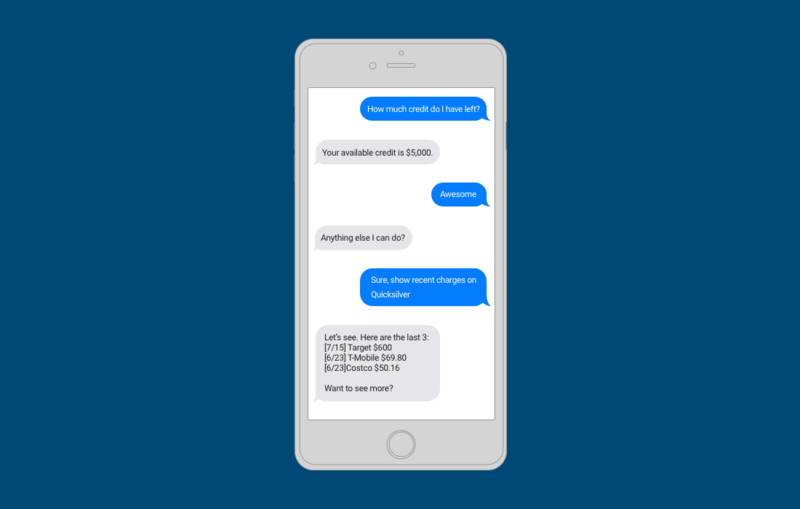 Capital One was the first major U.S. bank to introduce a natural language SMS chatbot to its customers (an invite-only pilot). But before that, the chatbot went through an associate pilot to gather feedback on its use cases and insights into how the infrastructure would perform at scale. 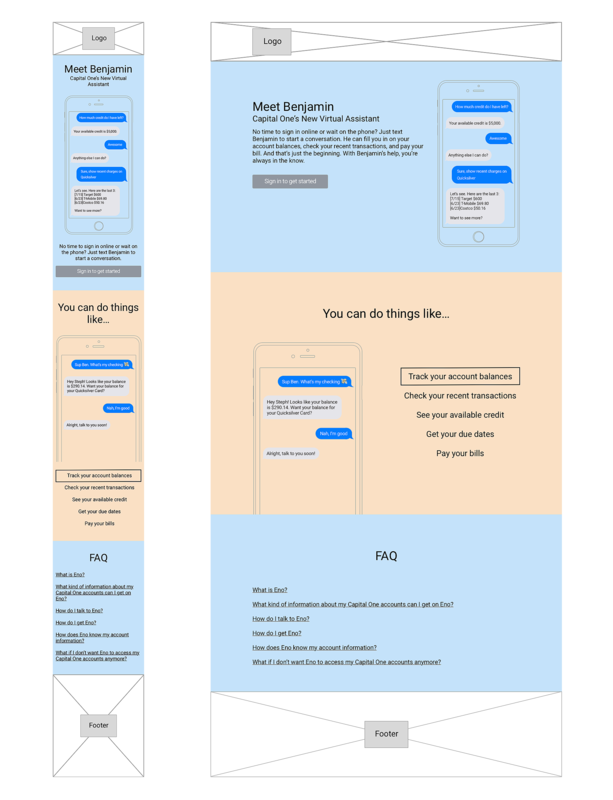 Although the chatbot is now named “Eno,” at its inception, it was called “Benjamin.” Our team needed to market Benjamin internally so that we could gather sufficient feedback for that cycle of iteration. The challenge was to describe a new concept to an audience who may not have heard about it. Before writing a draft of the content, we needed to agree on how to describe Benjamin. I created a writing exercise to answer some product questions with the lead content designer. Doing this helped us lay everything out on the table before sitting down to write. The lead content designer and I worked through a series of questions in a secure, shared doc. This is a partial list, recreated in Github. We initially decided to characterize the chatbot as a person because our goal was for people to develop a relationship with Benjamin. The concept, “virtual assistant,” made sense in that context since it communicated a digital persona. We also explored customers’ contexts to explain why the chatbot would provide unique value to their existing relationships with the bank, along with features and benefits that might appeal to them. This formed the basis of our messaging strategy. After gathering enough details about the product we needed to describe, we created different variations of the rough drafts. We worked individually as well as did pair writing to talk through what’s important. 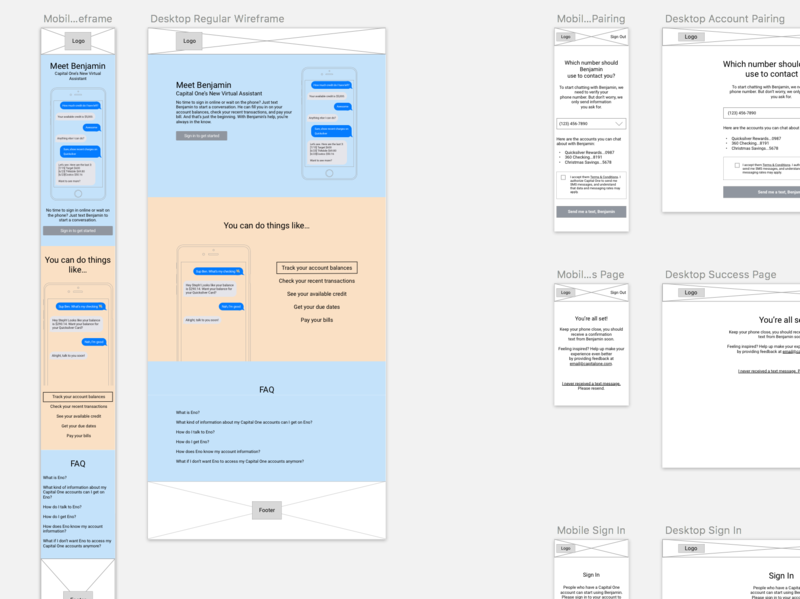 Since we already received rough wireframes for the user flows, we wrote with that in mind while pushing boundaries where it made sense. 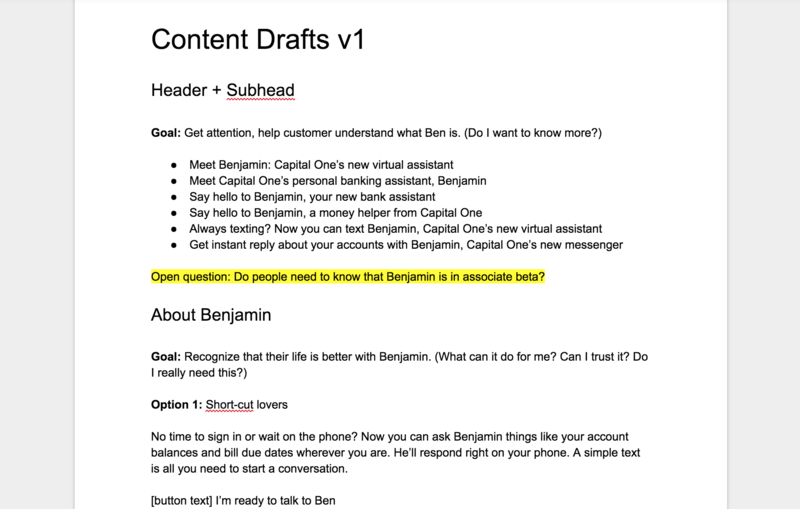 While passing drafts and edits back and forth, we collaborated on the demo content that showed what kind of conversations people can have with Benjamin. 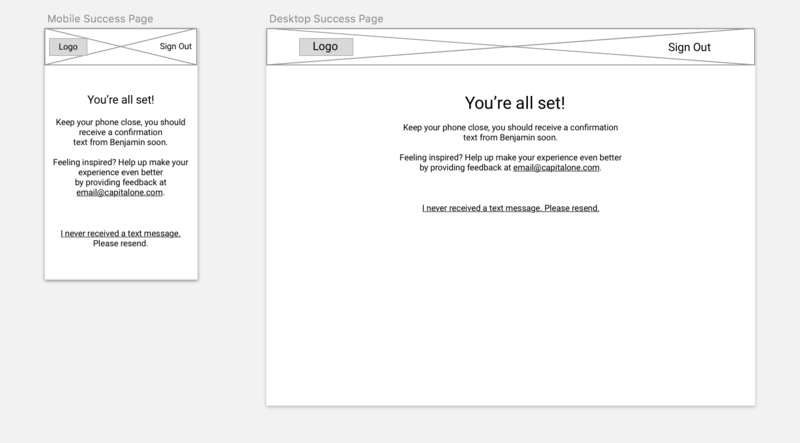 Writing with the wireframes in mind, we had a rough idea about how the content should flow. 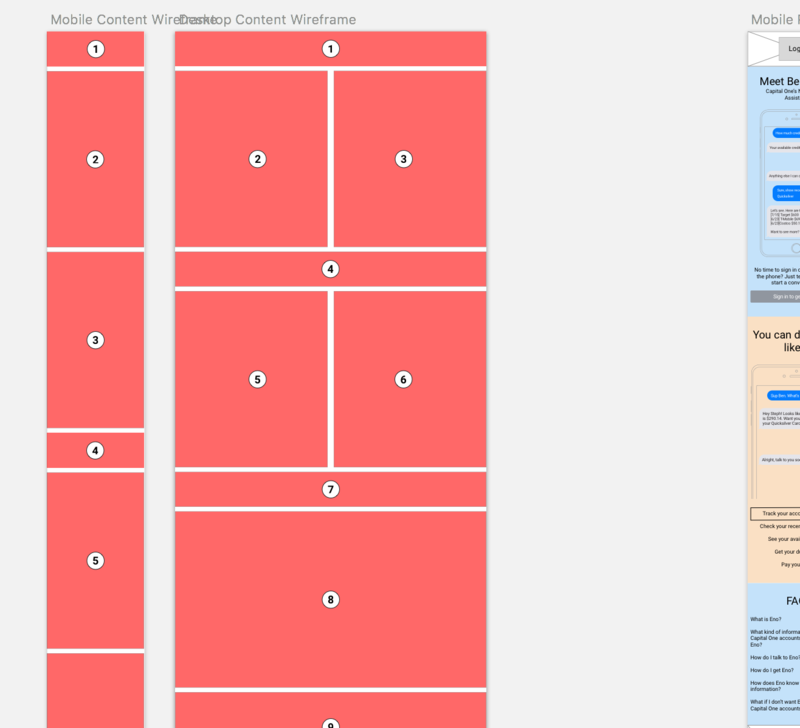 I sketched out how content chunks could be arranged in mobile and desktop wireframes. This enabled me to organize Benjamin’s narrative and create an information hierarchy for the site. To show my messy sketches more clearly, I created an example in Sketch. We continued to trade feedback with the UI designer and developer while they iterated on the prototypes. 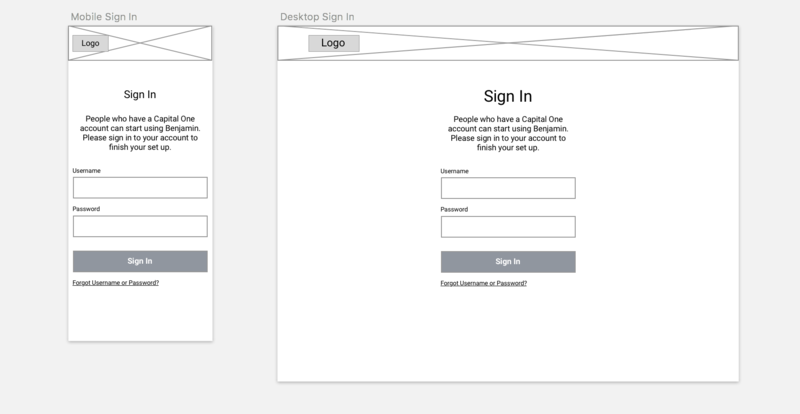 They advised us on existing design patterns that Capital One used. Since I don’t have the original design asset, I created a similar mockup to show our content layout. Using existing design patterns, we also wrote microcopy (i.e. button copy, anchor link text, etc.). Since this project required a tight turnaround, we created only a few iterations. Although, my internship ended before the final version was implemented, our team successfully introduced Benjamin to Capital One associates (before the chatbot was renamed to the gender-neutral “Eno”). In March 2017, Eno was released as an invite-only public beta. Eno is now available to all Capital One bank and credit card customers. Since I left before the final version was implemented, I can only show what I worked on up to my departure. The following is a recreation of what was proposed up to that point so the content could be shown in context of a UI. People initially arrive at the landing page after following a link from an email, etc. After they click on “Sign in to get started”, they’re taken to a sign in page. Then they need to confirm the phone number they want to use and accept the Terms and Conditions. 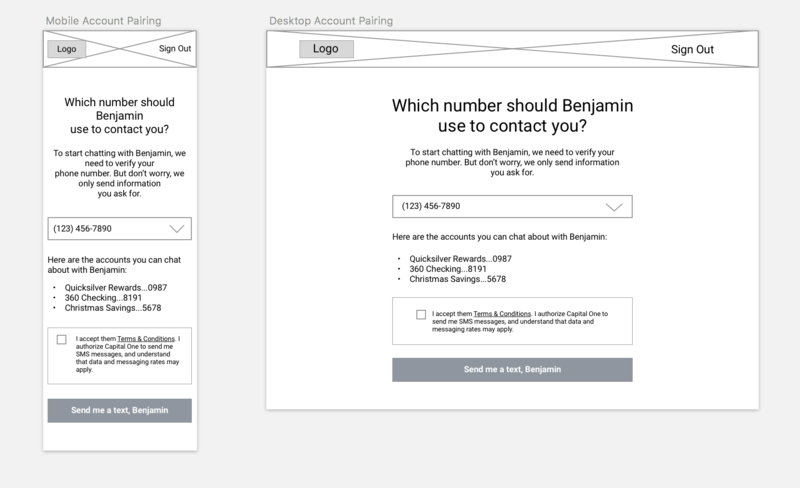 When they click on “Send me a text, Benjamin”, they reach the success page where they’ll await a text from Benjamin.